Drivers pass underneath the Bridge to Nowhere on Friday afternoon. 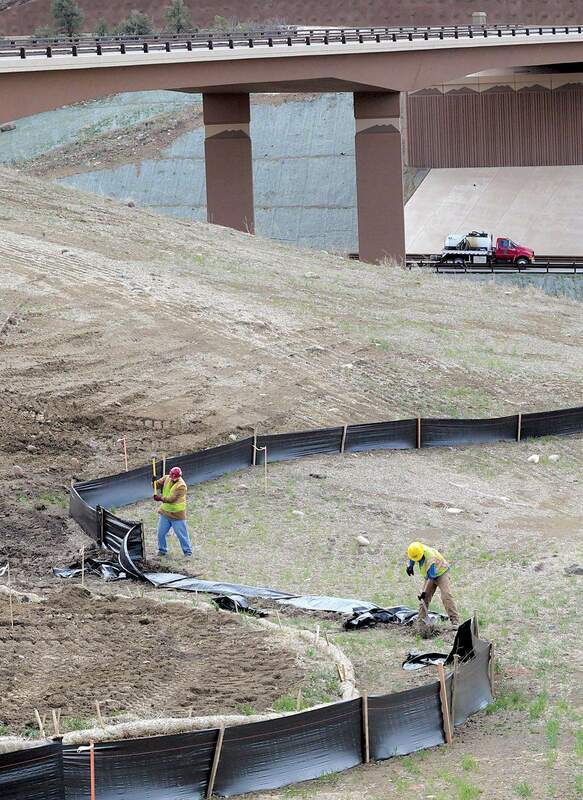 Workers repair a silk fence used for erosion control on Friday afternoon at the Bridge to Nowhere. 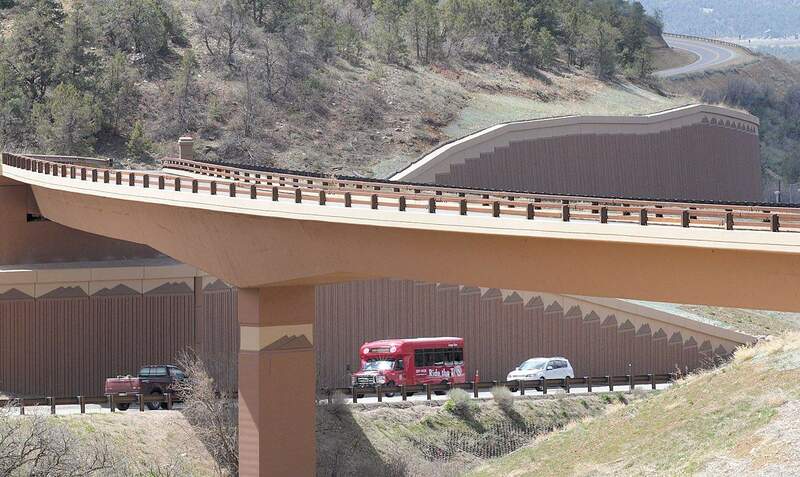 The Colorado Department of Transportation has resumed work on a $47 million interchange that is home to Durangos infamous Bridge to Nowhere. The agency this summer will do earthwork, paving, improve drainage, build access roads, and install signs and lighting along the Grandview corridor on U.S. Highway 160. The final phase is expected to be completed this fall. What the final phase lacks is a new connection with U.S. Highway 550  one of the key components of the revamped interchange. b Swinging Highway 550 far to the east and connecting it with the Three Springs intersection. b Weaving Highway 550 across the Florida Mesa and connecting it to the Three Springs intersection. b Routing Highway 550 through the Webb Ranch and connecting it to the $6 million Bridge to Nowhere. The last option hit a snag in 2007 when CDOT discovered a gas well had been developed on the Webb Ranch. 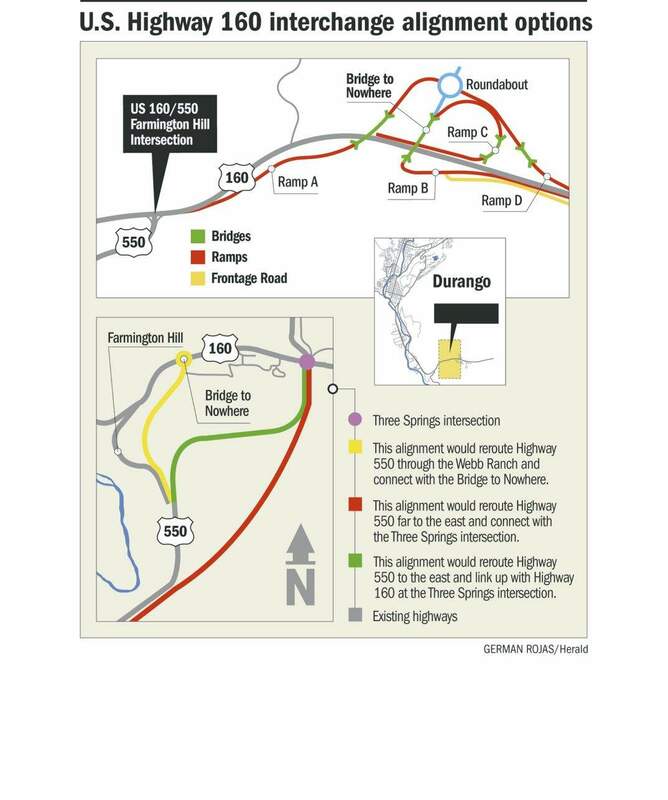 If CDOT is unable to connect Highway 550 to the Bridge to Nowhere, it will end up serving as an elaborate on- and off-ramp for the sparsely populated south Grandview area or a deluxe U-turn for westbound motorists on Highway 160. Still, CDOT officials insist the overall project is a success. 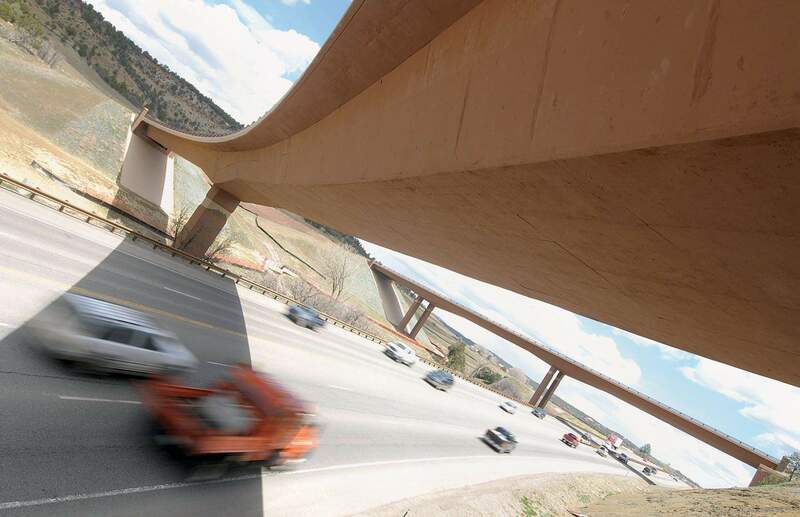 Planning for the interchange began in the early 1990s when a statewide group identified 28 high-priority transportation needs, including upgrades to the Highway 160 corridor between Durango and Bayfield. The Bridge to Nowhere was intended to serve as an alternative to Farmington Hill, where the two-lane Highway 550 has steep switchbacks and an abrupt drop-off on one side, said Steve Parker, CDOT commissioner for District 8, which includes 13 counties in Southwest Colorado. The completed interchange will consist of four bridges, six retaining walls and a 2,000-foot-long multi-use foot path. It also adds a fourth lane to a stretch of highway, a new signal at Farmington Hill and extensive drainage work. The Bridge to Nowhere is the largest and most expensive of the four new bridges. The three-lane bridge is 530 feet long  or about the length of 1½ football fields  and stands 47 feet above Highway 160. It utilizes 2,786 cubic yards of concrete and a half-million pounds of steel. CDOT built the famed overpass  even Denver media outlets have investigated it  from July 2008 through September 2010 believing it had done its due diligence by completing an environmental analysis, documenting archaeological sites, mapping historical structures and meeting with affected property owners. A formal decision issued in October 2006 identified the Webb property as the preferred realignment route for Highway 550. It was the culmination of a lengthy public process. Chris Webb, a Detroit lawyer who grew up on the ranch, understood CDOT was interested in realigning Highway 550 across his property. His Denver lawyer at the time,Thomas J. Ragonetti, wrote a letter dated Nov. 2, 2005, to CDOT expressing a willingness to work with the agency. But he hinted that the ranch may have development potential. Efforts to reach Webb last week for comment were unsuccessful. When CDOT realized it needed to avoid a gas well on the property, the realignment triggered another environmental review. But by that time, national standards had changed with respect to historic designations, and CDOT had to take into account entire ranch landscapes and not just individual structures. Adding to the agencys headaches, Webb slapped CDOT with a lawsuit, but he eventually lost. Despite the uncertainties surrounding the project, in 2007 the Federal Highway Administration said the interchange, including the Bridge to Nowhere, would serve a legitimate purpose regardless of whether Highway 550 connected with the bridge. That gave CDOT the green light to start building. CDOT now is spending $102,000, not to mention staff time, on a supplemental environmental analysis that again will review the impacts associated with realigning Highway 550. The supplemental report will look at four historic ranches on the mesa, Shanks said. CDOT will hold another public hearing, a public-comment period and a new record of decision will be issued early next year, Shanks said. If the final decision again recommends realigning Highway 550 across the Webb Ranch, CDOT will try to acquire the land it needs from the Webbs by paying fair market value. If that is unsuccessful, CDOT could try to obtain the land through condemnation. If, as is now being considered, Highway 550 is rerouted to the east around the Webb Ranch, it would affect three additional ranches with historic designations. CDOT also has proposed two more interchanges in the Grandview area  one at the Three Springs intersection and one at Elmores Corner (Highway 160 and Colorado Highway 172). It also plans to make the 13-mile stretch of Highway 160 between Grandview and Bayfield four lanes. Those improvements are all dependent on funding. The reconstruction is needed to meet 20-year traffic demands, according to CDOT engineer Mike McVaugh. The Grandview corridor experienced 27,875 vehicle trips on peek travel days in 2009, and that number is expected to increase to 44,478 per day by 2030, based on current growth factors. If the Grandview area builds out to its full potential, vehicle trips could reach 85,910 per day by 2030.